A wood stove without a CSA \ ULC listing tag is classified as a non certified or uncertified appliance. As such, the following clearance to combustibles are required in Canada. Please check your Provincial building code requirements, and local authority having jurisdiction for the requirements specific to your area. 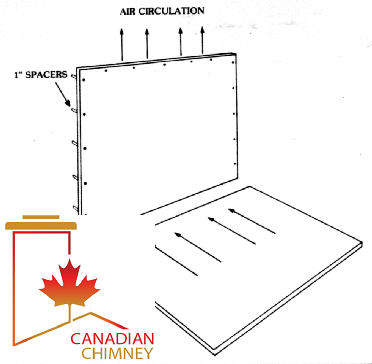 Clearance to combustible requirements for non certified radiant wood stove is 1200 mm (48"). A stove with a metal jacket casing requires 900 mm (36"). 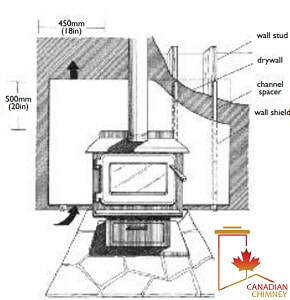 Wood stoves certified for installation in an alcove may not be reduced, unless otherwise stated by the appliance manufacturer or AHJ. The shielding on a non certified stove can come in many forms and has to be spaced out from the appliance at least 50 mm (2") using non combustible spacers. 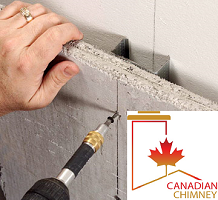 Installing a jacket onto a non certified stove reduces the clearance requirements from 1200 mm (48") to 900 mm (36"). Heat shields may be constructed using sheet metal, ceramic tiles, bricks, or a combination of sheet metal with brick or tile. 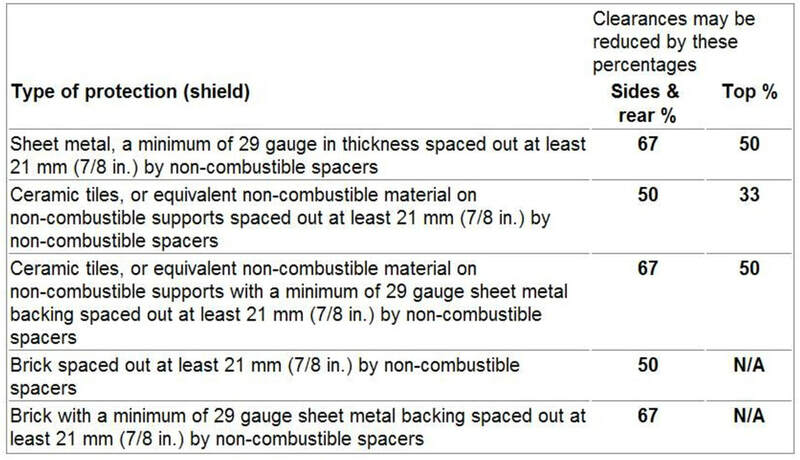 The table above illustrates that a maximum of 67% of clearance reduction can be achieved by using a compliant heat shield. These clearance reductions do not apply to floor protection. Floor protection requirements for non certified stoves can be complicated, so it's best to contact your local certified chimney sweep for details. Shields must be permanently mounted to walls and not temporary or a folding type shield.